The Soft Hands 100% cotton gloves help promote the absorption of creams and gently cover and protect the hands from injuries and skin disorders. 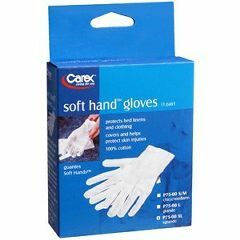 These gloves prevent staining of clothing and bedding from lotions and creams. For use with right or left hand. AllegroMedical.com presents The Soft Hands Infection Control Glove. Use this item to aid in the absorption of creams or to protect and comfort the sensitive skin on handsThe Soft Hands 100% cotton gloves help promote the absorption of creams and gently cover and protect the hands from injuries and skin disorders. These gloves prevent staining of clothing and bedding from lotions and creams. For use with right or left hand.